Draft: 2010, Houston Astros, 1st rd. 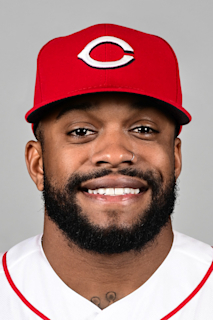 Delino Diaab DeShields…changed his uniform number from #7 to #3 prior to the 2016 season…his father, Delino Lamont DeShields, had a 13-year major league career with Montreal (1990-93), Los Angeles-NL (1994-96), St. Louis (1997-98), Baltimore (1999-2001), and Chicago-NL (2001-02) after being a 1st round pick by Montreal in 1987…the elder Delino was promoted to Reds first base coach in 2019 after spending 10 seasons in the Cincinnati minor league system…his mother, Tisha, was an All-America track & field athlete (heptathlon, 1991) at the University of Tennessee…also qualified for the 1992 Olympics in Barcelona…Delino's sister, Diamond, played basketball at North Carolina and Tennessee, and was selected 3rd overall in the 2018 WNBA draft by the Chicago Sky…hobbies include playing guitar, video games, and reading…favorite vacation spot is Jamaica. Was limited to 106 games during injury-riddled campaign…batted .316/.381/.368/.749 (12-38) in last 18 G to raise final average from .203 to .216…reached safely in 18 straight G from 4/23-5/12, including career-best 10-G hit streak from 4/27-5/6…career-high 4 BB 5/9 vs. DET, most by a Ranger since start of '09…walk rate (9.1 PA/BB) was best of career and would have ranked 3rd on club if he qualified…averaged 4.73 plate appearances per strikeout, his best figure since 2015 (4.87)…made 93 starts, all in center field, and ranked 2nd on club with 49 starts in leadoff slot (100-Choo)…his .281 SLG was lowest of his career, and lowest in MLB (min. 300 AB) since 2015 (Ichiro Suzuki - .282 SLG for Marlins)…club was 26-11 in games DeShields scored a run, winning 12 in a row from 6/16-9/24…career-high 7 E's were T4th-most among A.L. outfielders…was on option at Round Rock (AAA), 7/24-27, and went 2-for-12 in 3 G with the Express. Posted career highs in batting average (.269), on-base pct. (.347), and home runs (6), while totals in other categories approached his 2015 rookie season figures…ranked 5th on club with 44 BB and 75 R…made 102 starts in LF (teamhigh 57), CF (42), and DH (3)…started 27 of club's final 29 games, and 41 of last 47 G…led Texas with 78 starts in leadoff slot…career-best .991 fielding pct. (2 E/219 TC) and ranked T8th in A.L. with team-high 9 OF assists. BATTING / HOME RUNS // Hit .268 in 1st 20 G through 5/6, then went 0-for-13 in next 4 G to bring season mark to .217…from 5/12-9/3, batted .308/.385/.421/.806 (66-214) to rise to .286, his highest post-break figure…beginning 9/4, hit .215 (20-93) the rest of the way to finish at .269…had a careerbest 19-game on-base streak from 8/13-9/6, 4th-best on the club in 2017…his career-high 6 HR included 1st career inside-thepark HR on 9/26 vs. HOU, 2nd by a Ranger in 2017 (Joey Gallo on 6/21 vs. TOR)…marked one of his 3 HR in September…also hit his 1st 2 career leadoff HR on 5/2 at HOU and 8/2 vs. SEA. NOTES // Posted 1st career walk-off hit with single in 13th inning on 4/20 vs. KC…on 4/26 vs. MIN (2-3, 3 BB, 3 R), became 1st Texas leadoff batter since 2013 to reach safely 5+ times with 3+ R in a 9-inning game. Was the club's Opening Day centerfielder and batted .209 (38-182) with 4 HR and 13 RBI in 74 games over 2 stints: Opening Day-5/12 and 7/20-end of season…made 30 starts in CF, 2nd-most on the club, and 19 starts in LF…doubled his home run output from 2015 with 4 long balls, but his totals in nearly every other category were lower than his 2015 rookie campaign…hit .326 (14-43) over 1st 12 games through 4/16, and had average as high as .250 on 5/2, but hit .173 (17-98) in his final 51 games with Texas beginning 5/3 to finish the year at .209…played in 4 games with Obregon in the Mexican Winter League, going 2-for-15 with a walk, 2 RBI, and 2 stolen bases. Was the Rangers Rookie of the Year in his first season in the organization…started 85 games in center field and 25 in left field and was in the lineup for 107 of final 137 regular season games…ranked among American League leaders in bunt hits (first, 12), triples (fifth, 10), stolen bases (tied for fifth, 25), and sacrifice bunts (tied for eighth, 7)….was among the league rookie leaders in runs (first, 83), walks (tied for first, 53), stolen bases (second), triples (second),doubles (second, 22), games (fourth, 121), at bats (fourth, 425), and hits (fifth, 111)… his .344 on-base percentage led all A.L. rookies with at least 450 PA and was 3rd highest on the team…led the Rangers in triples in 3B, tied for first in SB, tied for second in runs, and was third in BB…tied Ruben Sierra (1986) and David Hulse (1993) for most triples ever by a Texas rookie, tied for second most overall…had second most runs ever for a Rangers rookie (Bump Wills, 87 in 1977)…tied Cincinnati's Billy Hamilton for second in the majors in bunt hits, four behind Miami's Dee Gordon. Invited to Astros major league spring camp for a 2nd straight season, DeShields spent the year at Corpus Christi (AA)...batted .236 with 11 home runs and 57 RBI over 114 games in his first Double-A action, leading Texas League with 54 stolen bases and 18 sacrifice hits...also ranked among league leaders in runs (2nd, 75) and walks (T4th, 61)...led Hooks in hits (97), RBI (57), and total bases (148)...saw bulk of action in center field (78 G) and left field (29 G) after playing exclusively at 2nd base from 2011-13...played almost all games in top 3 spots in the batting order, including 65 games in leadoff slot...the right-handed batter hit .269 (25-93) off lefties, .226 (72-318) against righties...was on disabled list 4/19-5/7 with a concussion and fractured cheek bone after he was hit in the face with a pitch on 4/18 at Frisco...Phil Klein, who would go on to pitch for the Rangers last season, was on the mound for that plate appearance...converted 16 straight steal attempts from 6/25-7/20...11 different multi-steal games, season-high 3 SB both 5/12 at San Antonio and 6/28 at Tulsa...2-HR games 5/9 at Frisco and 8/25 at San Antonio, season-high 5 RBI in the latter contest...entered the season ranked as a top Houston prospect and top 100 prospect by both ESPN.com (6th/80th) and MLB.com (7th/74th)...rated Astros' 13th-best prospect by Baseball America. Entered the season as the Astros No. 6 prospect and as a NRI at Astros Spring Training...impressed in Spring after hitting .412 (7x17) with 10 runs scored, one double, two steals and one RBI in 14 games...played his entire season at Class A Advanced Lancaster, hitting .317 (143x451) with 25 doubles, 14 triples, five home runs, 54 RBI, 51 stolen bases and a .405 on-base percentage...ranked second in the California League in OBP, triples and steals, and third in batting average and runs scored...got off to a slow start to the 2013 season (hit .250 in April), but was one of the top hitters at the Class A Level from July thru the end of the season...over that span, he ranked third among all Class A hitters with a .359 batting average while adding 55 runs, 16 doubles, eight triples, three homers, 31 stolen bases and a .993 OPS (.438 OBP/.555 SLG) in 50 games...was Lancaster's Player of the Month in August after hitting .365 (35x96) with seven doubles, five triples, 12 RBI and 11 stolen bases in the month...played in the All-Star Future's Game at Citi Field, along with fellow Astros prospects Carlos Correa and George Springer...played for Peoria in the Arizona Fall League and hit .275 (19x69) with four doubles, one triple and six RBI in 22 games...after playing the entire regular season as a second baseman, moved to center field for the AFL. Was the Astros 2012 Minor League Player of the Year after hitting .287 (154x537) with 113 runs scored,24 doubles, eight triples, 12 homers, 101 steals, 83 walks and a .389 on-base percentage in 135 combinedgames between Class A Advanced Lancaster (24g) and Class A Lexington (111g)...ranked second in the minor leagues with 101 stolen bases, trailing only Billy Hamilton's total of 155...DeShields' 101 steals alsoset an Astros minor league record...became the first minor league player in the modern era to steal 100-ormorebases and hit 10-or-more home runs in one season...in 1887, Count Campau accomplished the featwhile playing in the Southern League...DeShields was also just the fourth minor leaguer since 2000 to tally100-or-more stolen bases in one season...named the Most Valuable Player of the 2012 California LeagueChampionship Series after he helped push the club to its first ever league title...hit .462 (6x13) with two stealsin the three game set, including a solo home run in the deciding game of the series...led the South AtlanticLeague in stolen bases (83) and ranked tied for second in runs (96)...was one of just eight players namedto Baseball America's 2012 Minor League All-Star Team...has a long list of accolades from the 2012 season:Lexington Legends Team MVP, SAL Midseason All-Star, SAL Postseason All-Star, MiLB.com OrganizationAll-Star, Topps Class A All-Star...following the season, was ranked by Baseball America as the No. 6 prospectand 'Fastest Baserunner' in the Astros system...also rated by the publication as the No. 12 prospect, 'FastestBaserunner' and 'Best Baserunner' in the South Atlantic League...ranked by MiLB.com's 2012 Prospect WatchList as the No. 2 second base prospect in baseball. Entered the season ranked as the Astros No. 2 prospect by Baseball America...played his first full season with Class A Lexington, playing most of the season at the age of 18, the sixth-youngest player in the South Atlantic League...spent the season adjusting to second base, after having been an outfielder in high school and in 2010...committed seven errors in his first 11 starts at second, but then committedonly four errors in his next 48 games at second through July 4...earned Lexington's Defensive Player of the Month honor in May and July...committed only one error in 19 games at second base in May...hit .245 (49x200) with three homers, 15 stolen bases and 21 RBI over his final 52 games...finished his season with 30 stolen bases, which ranked second among all Astros minor leaguers...was successful in 22 of his last 25 attempts, including 11 straight from June 5-July 6. Signed with Houston on Aug. 5 and reported to the Astros GCL club in Kissimmee...played in two games before bumping up to Class A Greeneville...hit .313 (21x67) with eight RBI in his 16 games at Greeneville. 1 de septiembre de 2018 Texas Rangers activan a CF Delino DeShields de la 10-d&iacute;a lista de lesionados. 28 de agosto de 2018 Texas Rangers envian a CF Delino DeShields una asignaci&oacute;n de rehabilitaci&oacute;n a Frisco RoughRiders. 17 de agosto de 2018 Texas Rangers ponen a CF Delino DeShields on the 10-d&iacute;a lista de deshabilitado. Right middle finger fracture. 12 de agosto de 2018 Texas Rangers activan a CF Delino DeShields de la 7-d&iacute;a lista de deshabilitado. 4 de agosto de 2018 Texas Rangers ponen a CF Delino DeShields on the 7-d&iacute;a lista de deshabilitado. Concussion. 28 de julio de 2018 Texas Rangers llamado CF Delino DeShields de Round Rock Express. 24 de julio de 2018 Texas Rangers opcionado CF Delino DeShields para Round Rock Express. 22 de abril de 2018 Delino DeShields estado en la lista cambian a por Texas Rangers. 19 de abril de 2018 Texas Rangers envian a OF Delino DeShields una asignaci&oacute;n de rehabilitaci&oacute;n a Frisco RoughRiders. 31 de marzo de 2018 Texas Rangers ponen a LF Delino DeShields on the 10-d&iacute;a lista de deshabilitado. Fractured hamate bone in left hand. 4 de noviembre de 2016 Yaquis de Obregon ponen a OF Delino DeShields en la lista de reserva. 29 de octubre de 2016 Yaquis de Obregon activan a OF Delino DeShields. 29 de octubre de 2016 Yaquis de Obregon ponen a OF Delino DeShields en la lista de reserva. 22 de octubre de 2016 OF Delino DeShields asignado a Yaquis de Obregon. 11 de octubre de 2016 Texas Rangers activan a LF Delino DeShields. 6 de octubre de 2016 Texas Rangers reasignado CF Delino DeShields a las ligas menores. 20 de julio de 2016 Texas Rangers llamado CF Delino DeShields de Round Rock Express. 13 de mayo de 2016 Texas Rangers opcionado CF Delino DeShields para Round Rock Express. 5 de julio de 2015 Texas Rangers activan a LF Delino DeShields de la 15-d&iacute;a lista de deshabilitado. 27 de junio de 2015 Texas Rangers envian a LF Delino DeShields una asignaci&oacute;n de rehabilitaci&oacute;n a Round Rock Express. 11 de diciembre de 2014 Texas Rangers redactado LF Delino DeShields. 30 de octubre de 2014 OF Delino DeShields asignado a Cangrejeros de Santurce. 8 de mayo de 2014 Corpus Christi Hooks activan a CF Delino DeShields de la 7-d&iacute;a lista de deshabilitado. 19 de abril de 2014 Corpus Christi Hooks ponen a OF Delino DeShields en la 7-d&iacute;a lista de deshabilitado. 2 de abril de 2014 OF Delino DeShields asignado a Corpus Christi Hooks de Lancaster JetHawks. 14 de enero de 2014 Houston Astros invitado fuera del roster CF Delino DeShields para spring training. 27 de agosto de 2013 CF Delino DeShields asignado a Peoria Javelinas. 12 de mayo de 2013 Lancaster JetHawks activan a 2B Delino DeShields de la 7-d&iacute;a lista de deshabilitado. 6 de mayo de 2013 Lancaster JetHawks ponen a 2B Delino DeShields en la 7-d&iacute;a lista de deshabilitado retroactivo al May 5, 2013. 17 de enero de 2013 Houston Astros invitado fuera del roster 2B Delino DeShields para spring training. 10 de agosto de 2012 2B Delino DeShields asignado a Lancaster JetHawks de Lexington Legends. 6 de febrero de 2012 Houston Astros invitado fuera del roster 2B Delino DeShields para spring training. 4 de abril de 2011 Delino DeShields asignado a Lexington Legends de Greeneville Astros. 18 de marzo de 2011 OF Delino DeShields asignado a Houston Astros. 13 de agosto de 2010 Delino DeShields asignado a Greeneville Astros de GCL Astros. 6 de agosto de 2010 Delino DeShields asignado a GCL Astros de Houston Astros. 5 de agosto de 2010 Houston Astros firmado 2B Delino DeShields.